Defense Minister says Israel appreciates the efforts the US was putting into negotiations, but would manage if things didn't work out. Speaking at a security conference in Munich, Yaalon said that Israel had some minimum demands in the negotiations, including an agreement by the Palestinians to give up any further demands for territory beyond what would be agreed to in a deal, recognition of Israel as the homeland for the Jewish people, and security arrangements. Without those, Israel could not accept a deal, he said. 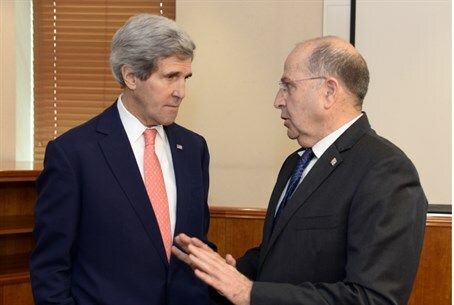 “I support the negotiations and encourage the political involvement” of Kerry and others, said Yaalon. “But we have to tell the truth and not fool ourselves regarding PA chief Mahmoud Abbas's intentions. Will he be prepared to recognize Israel as a Jewish state? He has given us a clear answer, and it is no,” the Defense Minister said. The heart of the matter, Yaalon told the audience, was not “the liberated or occupied or conquered territories of 1967. This conflict began long before the dawn of Zionism. I do not sense that the Palestinian leadership will be ready to agree to a partition of the land and drop all further claims. Yaalon recently got into diplomatic hot water when an Israeli newspaper quoted him as saying that Kerry is "obsessive" and "messianic." He reportedly fumed at Kerry's maneuvers, saying that the American security plan presented to Israel "is not worth the paper it was written on" and "contains neither security nor peace. Only our continued presence in Judea and Samaria and the Jordan River will guarantee that Ben Gurion Airport and (the northern city of) Netanya do not become targets for missiles from every direction." “Secretary of State John Kerry – who came here very determined, and operates based upon an unfathomable obsession and a messianic feeling – cannot teach me anything about the Palestinians,” he was quoted as saying. Although media reports warned that Yaalon would be sidelined by the US in response to the leak of his harsh criticism, he has since met with US Defense Secretary Chuck Hagel and it appears that any bad blood with the US has been smoothed over.